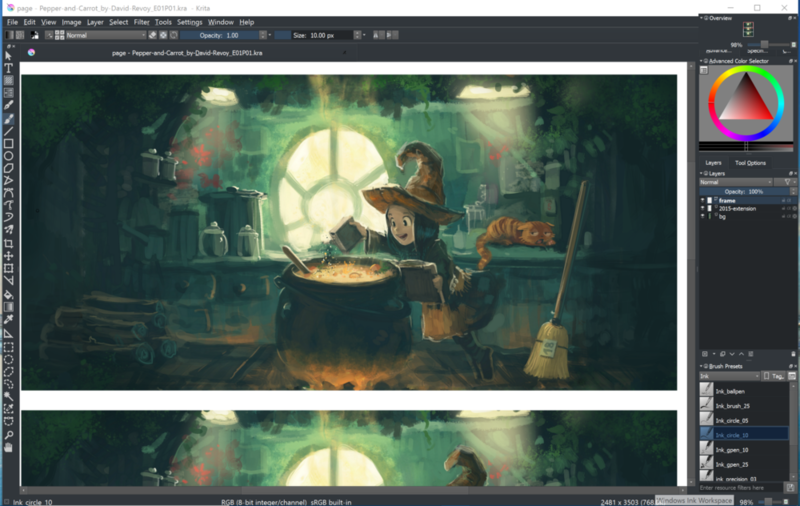 Krita is a very robust and full-featured open source software that aims to be a Photoshop killer, reminiscent of the ambitions of the 3d application Blender. The software is maintained by contributions to the Krita Foundation. The UI is rather crowded and doesn’t scale perfectly for tablet use. The toolbox is especially small by default, but the icons can be scaled up to 64x64. In the screen grabs here, the icons are 32x32. Brush icons and palette gadgets can also be very small on the Surface Pro 4. Pen mode is set by default (I couldn’t find a way to finger paint). Pan and zoom both require two fingers. There is no rotate gesture. A streamlined tablet version called Krita Gemini is available via Steam for $50.